This graphic novel is signed on the first page by Mike Norton. The epic tale of blood and drool begins here! Join Molly and her dogs Mingo and Colfax, as she recounts the legend of "The Warrior and the Battlepug"-a tale of a fearless barbarian, his trusty and freakishly large pug, and evil baby harp seals. 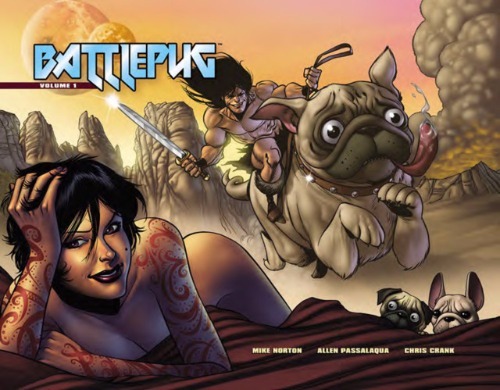 This volume collects the first year of Mike Norton's Battlepug-the perfect opportunity to get in on the ground floor of the fan-favorite webcomic by Mike Norton, Allen Passalaqua, and Crank!